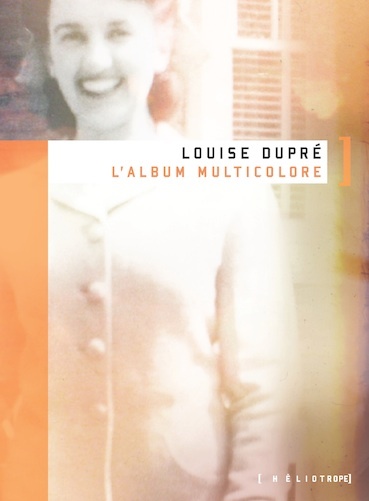 In L’album multicolore Louise Dupré comes face to face with the death of a true matriarch, her own mother, and places the reader in the same position. While the book describes Dupré’s own grieving process in depth, putting it squarely in the non-fiction camp, it often reads like a novel. Many of the details are deeply personal and yet Dupré has managed to extend her own pain into something not only universal, but historically important. As we are led into Dupré’s memories, that often act as portraits and snapshots frozen in time, we are also given a front-row seat from which to observe arguably the most revolutionary period Quebec has known in its short existence. Dupré’s stance is not explicitly feminist, but the perspective is that of women: the change in mother–daughter relationships is held up as a mirror reflecting the evolution of Quebec society. Depth and individuality are leant to the previously archetypal Québécois character, the strong matriarch, through the portrayal of women’s pain, both physical and emotional. We see a portrait of women’s role in the province under Duplessis’ rule and then throughout the Quiet Revolution. We are shown women often reduced to mere creators of the next generation of Québécois, who were meant to settle the land by power in numbers. This account of Quebec life and heritage from the turn of the century to the present is strongest when it plays on familiar themes that many have explored before. Chief among them is that of women’s desolation in giving birth to girls destined to share their pains. From Toni Morrison to F. Scott Fitzgerald, it is a subject that has been treated time and time again without ever being exhausted. An image of life leading into death, which is at the center of this story, is developed through the close relation between the excruciating pain of childbirth and the struggle of dying. What could come across as clichéd and overwrought is here profound and foundational. When Dupré’s great-grandmother is on her deathbed receiving her last rites from her priest and tells him “Death, Father, I have seen it 17 times,” she illuminates the seemingly bottomless depth of universal female suffering that was for so long seen as a duty in Quebec. Here, there is at once loyalty to and contempt for the Catholic Church, the true driving force behind a society that would soon hit a wall. Through the vivid but short glimpses of her lineage, the author deconstructs our entire social history by using her family, full of binaries, as a map to be fleshed out. The personal and anecdotal flawlessly take on overarching, symbolic proportions through the juxtaposition of education and poverty, obedience and revolution, and femininity and masculinity. Not listening to yourself. Refusing to hear the little voice whispering in your ear to take care of yourself or, conversly, refusing to give way to despair? I’m not sure that I fully understood what my mother meant. But she was talking about women’s pain, that much I know. How many women in Quebec back then did not listen to themselves? The order came to them from very far away, from immigration to a freezing country, from the terrible life of colonization, from scurvy, wars, defeat, the obligation to reproduce to ensure the survival of French Canada, from ancestors who gave birth every year and those who died from it. Louisa, that grandmother I never knew, died following the big operation in 1911 after bringing five sons into the world. She had not had Leda’s luck. Leda was operated on in 1918 or 1919. And Émilie, Léda’s mother, had survived her 15 births, but had suffered barbaric pain each time. They needed two men to hold her down. What help could they actually provide her with? Would they prevent her from jumping out the window? Octavie, my grandfather’s mother, had 17 children in 16 years. Without any twins. When, at the moment of her last rites, the priest asked my great-grandmother if she was afraid of death, she answered, “Death, Father, I have seen it 17 times.” My mother would say pensively, “Childbirth at that time, you know.” No ultrasounds, no epidurals, no relief. And many children would not live to be six years old. None of Octavie’s daughters got married and, of her four granddaughters, only my mother ever had a man in her life. Should it really come as a surprise? My brothers and I are Octavie’s only descendants. It would seem that, for my mother, the desire to have children had been stronger than fear. Did that come from Léda? On the eve of her death, Octavie revolted, she wanted to remind the priest that he should have kept quiet. She knew far more than he did about the great passage, she knew about what he did not, he who had not had to fight off death 17 times. My mother told me a hundred times what Octavie said, but only after I decided not to have more children to avoid awakening fear in me. That might also be why she denied the pain of her own labours with all her strength.